The Cessna 188 is a family of light agricultural aircraft produced between 1966 and 1983 by the Cessna Aircraft Company. The various versions of the 188 — the AGwagon, AGpickup, AGtruck and AGhusky, along with the AGcarryall variant of the 185, constituted Cessna's line of agricultural aircraft. In the early 1960s Cessna decided to expand their already wide line of light aircraft by entering the agricultural aircraft market. They surveyed pilots and operators of other brands of agricultural aircraft to see what features and capabilities these operators were looking for. The resulting aircraft was a conventional single-seat, piston-engined, strut-braced low-wing agricultural airplane. The Cessna 188 borrowed heavily from the Cessna 180, the initial version using the same tail cone and fin structure as well as the same Continental O-470-R 230 hp (170 kW) powerplant. The 188’s airframe is predominantly built from 2024-T3 aluminum, with the chemical hopper constructed from fibreglass. The fuselage is of semi-monocoque construction and is pressurized on later models (using the dynamic pressure resulting from the aircraft's forward speed) to reduce induction of chemicals into the airframe. The Cessna 188 was first flown on 19 February 1965. The aircraft was certified and entered production in February 1966, with 241 aircraft delivered the first year. The initial design of the Cessna 188 was so successful that over its 17-year production run the basic airframe remained unchanged. Only the engines and the agricultural products dispensing systems were upgraded, other than some minor changes to the ventilation systems. 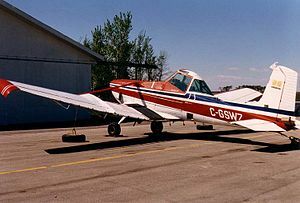 The main use for the Cessna 188 series was for agricultural purposes, but many examples were later acquired for use as glider and sailplane tugs. A total of 3976 Cessna 188s of all four variants were built during its production run, made up of 53 AGpickups, 1589 AGwagons, 1949 AGtrucks and 385 AGhuskies. Initial version powered by a Continental O-470-R 230 hp (172 kW) powerplant, a 200 US gallon (760 liter) chemical hopper, with a normal category gross weight of 3,300 lb (1,497 kg) and 3,800 lb (1,724 kg) in the restricted category. Certified on 14 February 1966. Powered by a Continental O-470-R 230 hp (172 kW) powerplant, a 200 US gallon (760 liter) chemical hopper, with a normal category gross weight of 3,300 lb (1,497 kg) and 3,800 lb (1,724 kg) in the restricted category. Certified on 26 September 1969. Powered by a Continental O-470-R or O-470-S 230 hp (172 kW) powerplant, a 200 US gallon (760 liter) chemical hopper, with a normal category gross weight of 3,300 lb (1,497 kg) and 3,800 lb (1,724 kg) in the restricted category. Certified on 20 December 1971, production ended in 1976. Initial version powered by a Continental IO-520-D 300 hp (224 kW) powerplant, a 200 US gallon (760 liter) chemical hopper, with a normal category gross weight of 3,300 lb (1,497 kg) and 4,000 lb (1,814 kg) in the restricted category. Certified on 14 February 1966. Powered by a Continental IO-520-D 300 hp (224 kW) powerplant, a 200 US gallon (760 liter) chemical hopper, with a normal category gross weight of 3,300 lb (1,497 kg) and 4,000 lb (1,814 kg) in the restricted category. Certified on 26 September 1969. Powered by a Continental IO-520-D 300 hp (224 kW) powerplant, a 280 US gallon (1060 liter) hopper, with a normal category gross weight of 3,300 lb (1,497 kg) and 4,000 lb (1,814 kg) in the restricted category. Certified on 20 December 1971, production of the AGwagon ended in 1981 and the AGtruck in 1985. Powered by a turbocharged Continental TSIO-520-T 310 hp (231 kW) powerplant, a 280 US gallon (1060 liter) hopper, with a normal category gross weight of 3,300 lb (1,497 kg) and 4,400 lb (1,996 kg) in the restricted category. Certified on 8 September 1978, production ended in 1985. ^ a b c d e f g Demand Media (n.d.). "The Cessna 188 Agwagon series". Retrieved 15 March 2010. ^ a b c d e f g h i Federal Aviation Administration (March 2003). "TYPE CERTIFICATE DATA SHEET NO. A9CE Revision 27" (PDF). Retrieved 2010-03-14. Cessna Aircraft Company (1973). 1973 Cessna Agricultural Aircraft. Wichita, Kansas: Cessna Aircraft Company. Wikimedia Commons has media related to Cessna 188. This page was last edited on 18 April 2019, at 14:58 (UTC).